At long last I am printing again! This is 'Future Mind', the second print in my Prints of Three's series. It's based off of a drawing that is in my 'Portrait' series style, where I start drawing without any preconceived idea of what the drawing will look like, and figure it out as go, so its meaning is open to your own interpretation. 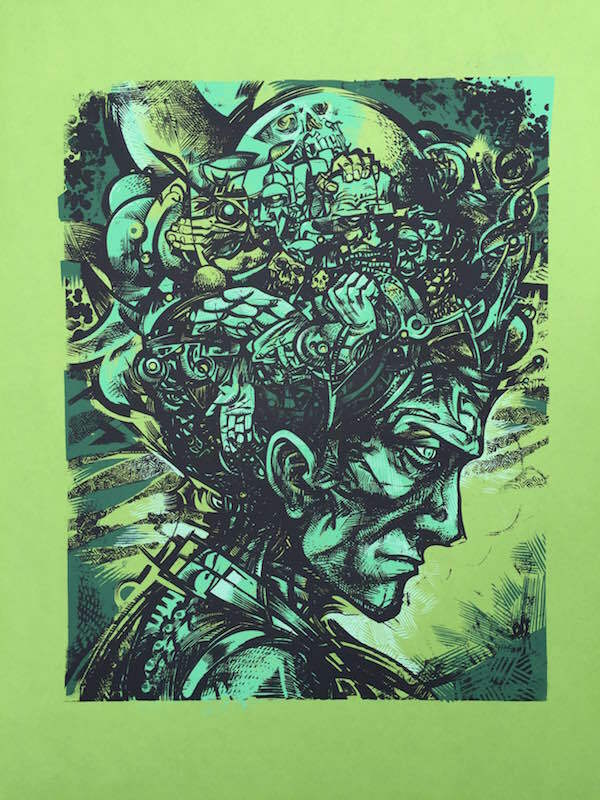 The print measures 18 x 24 inches, is 4 colors on 100 lb poptone paper from French Paper company, and is part of a signed and numbered edition of ONLY 33 prints. This print is ONLY available for 30 days, and if after that time any prints are still remaining they go into the DWITT Vault. The print, and all its variants, goes on sale Sept 30th, and you can get it exclusively here in the DWITT Market.